Screams, humor, sass and drama illuminated the beachy backdrop of jagged wooden waves at the Spokane Civic Theatre. Stunning beach hunks with fierce jawlines and strong-willed girls in pastel crop top and short combos caused a constant roar of chuckles from the audience. On Oct.13, the Spokane Civic Theater debuted Psycho Beach Party, their R-rated comedy slasher play. As part of the theatre’s 71st season, the show will continue running until Nov. 5. 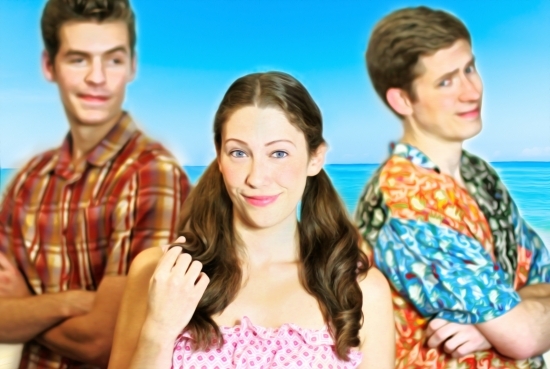 The play revolves around the young teenager Chicklet who has a dream of becoming a surfer. She begs and eventually convinces Kanaka, the best surfer around, to teach her. However, Chicklet's multiple personalities battle within her and emerge in outbursts of anger, preventing her from achieving her dream. “The play is a satire of those movies from the 60s. In those films they always had very stereotypical characters. The heroine was always this way and the hero was always that way. So, when casting this play, since it was satirizing that style, I wanted to make sure we filled those stereotypes in the best way possible. I looked for the hunky beach bum, for the best friend of the heroine, the nerdy geek,” director Jerry Sciarrio said. Close to 30 people auditioned and only 11 were chosen to be a part of this production. Sciarrio did a stellar job whittling the cast down to the perfect combination of performers with incredible chemistry and exceptional comedic timing.